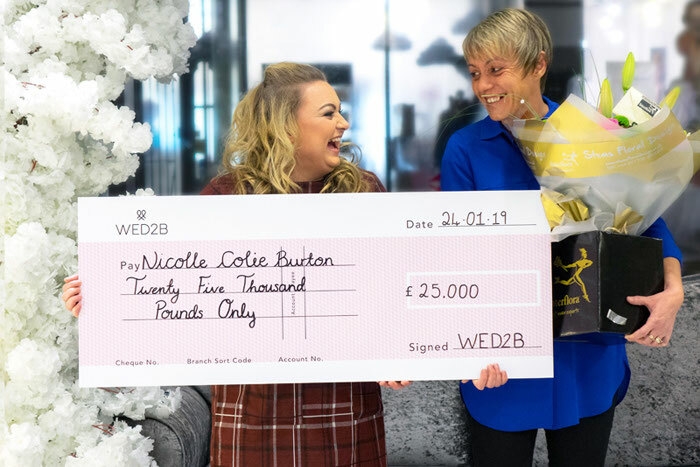 A bride-to-be from Rotherham has won a £25,000 cash prize from WED2B to put towards her wedding. The competition launched in September 2018 and received more than 4,000 entries. After a romantic proposal in Costa Adeje, Tenerife, Nicolle started the search for her wedding dress. She bought her dress from WED2B after visiting her local store twice. The competition comprised five challenges, putting brides and their #bridetribe to the test. These included tagging her bride tribe in WED2B’s Facebook and Instagram post, and having them suggest the best WED2B wedding dress style to suit the bride-to-be. Nicolle says: “The first time I visited with my sister I tried on about 12 dresses and was torn between two.” She returned the following weekend with her mum as she couldn’t decide between two dresses. The bride-to-be was then invited back to WED2B’s Rotherham store with her mum on Thursday 26th January. At this point Nicolle thought she had been shortlisted for the prize but had no idea she had actually won. It was then that she was surprised with a large cheque. Nicolle’s mother was with her during the big reveal. She says: “I’m so shocked. She’d been pretending she’d won the £25,000 and had already spent it. I’m sure some of it will go on a honeymoon”.